USGTF + PGA Certified Teaching Professionals. Unlike many golf club PGA pros, we concentrate on instruction ONLY. 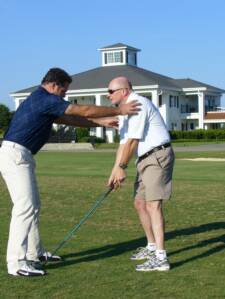 We specialize in teaching beginners the entire game of golf including swing fundamentals and etiquette instruction. Click on New Golfers for details. We will get the experienced player to the next level or fix reoccurring problems by customizing a set up and swing that reflects your body type and fitness level. Click on the Experienced tab for details. David Lippucci--Owner, has been involved in golf instruction for over 20 years and has been playing for over 40 years. David maintained the number one golf position on his high school golf team for two years and was on the Georgia Southern University golf team. David played on the Carolina Blonde tour for three years and was medalist and runner up at two events. David became a USGTF certified teaching professional in 2008 and has instructed many types of students and groups. David also owns Pucci Time Golf Schools concentrating on teaching students from K-6. Pucci Time Golf Schools brings the practice area to your school, home or event utilizing age appropriate equipment and swing aids. Range lessons last ONE AND A HALF HOURS! Private one on one instruction, discounts for two and three people per instructor. Half day, full day, two and three day on course etiquette instruction. Golf etiquette camp for business professionals. We will make you look, act and feel like a golf pro!